Buying the right washer and dryer set is a long term saving for your precious time and happiness of your household. 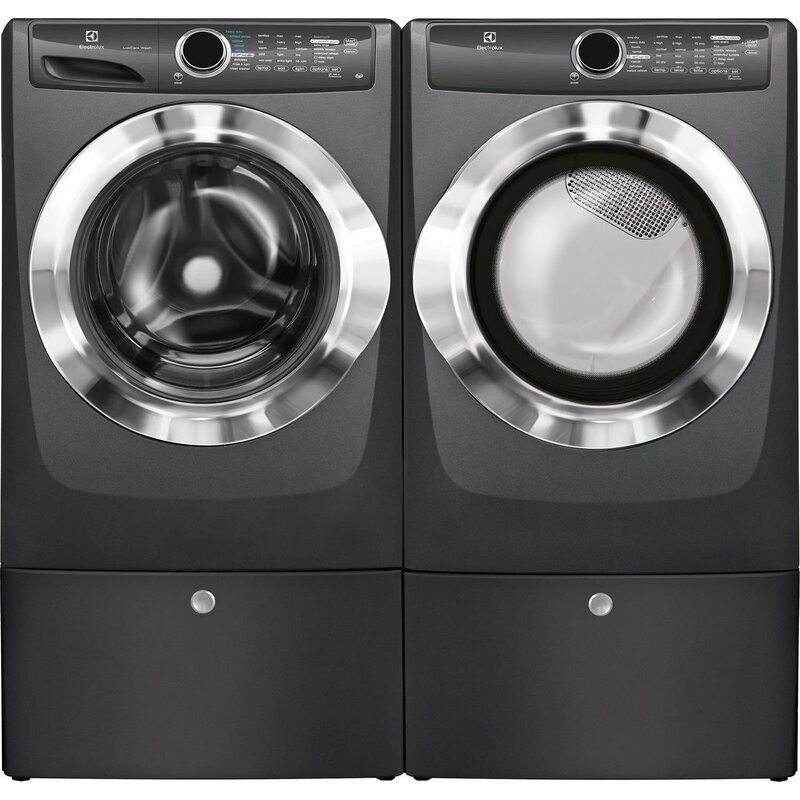 If you are looking for the best budget washer and dryer 2019 you are in the right place to seek a clear guide in buying these wonderful home appliances. In top 10 high rated list we have chosen only the most efficient and powerful to combat any test of dirt and wetness. Bosch, LG, Samsung, Electrolux and Maytag are well known washer and dryer brands which have served millions of households for such a long time. 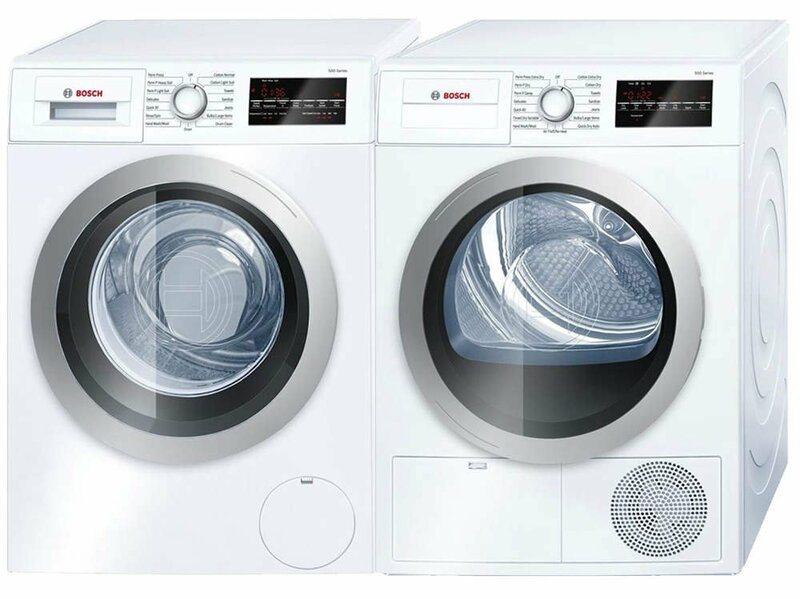 Front load 300 series washer from Bosch with 24 inch size has 15 wash varios cycles. From heavy duty to delicate regime WAT28400UC provides cycle selection for everything. Jeans wash cycle is even included to save long lasting denim. There is also Allergy washing regime that heats up to 145 degrees in Farenheit to get rid off allergy elements like germs and dust. Here comes front load electric dryer WTG86400UC with size of 24 inches. To get different needs of drying this dryer has 15 drying cycles and 4 temperature options. There is a quick drying option while you do not want to spend extra time in laundry room. 15.4 lb.s of capacity it can bear. One of the prominent benefits of Bosch WTG86400UC is running quiet feature. 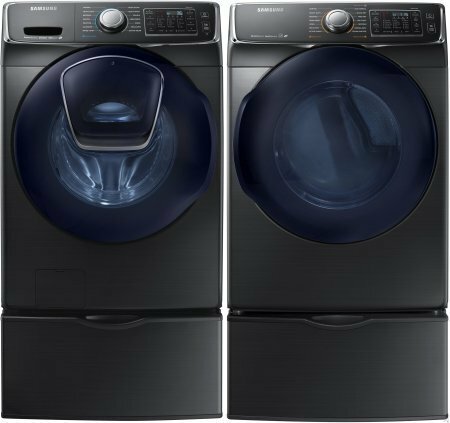 WF50K7500AW washer offers some surprising features that you never heard of. Addwash door system allows you to add your forgotten items even if the washing machine is on the washing process. After you close the door the washing will continue. 5 cu. ft. capacity lets you wash enough items while single load allows you save your time. In less than 30 minutes you can wash your items by full load with 50% faster super speed feature. By mobile gadget you can remotely control and monitor your washing process via Wi-Fi connectivity. Power Foam feature enables the water get deep into fabric to clean in microscopic scales. WF50K7500AW implements steam by releasing from the bottom of a laundry to remove stains deeply. At high spin this washer keeps quieter than other regular washers by 40%. For every forty wash cycles this washer self-cleans the washer drum by removing bacteria and dirt. To save consumer’s effort and time DV50K7500EW dryer has 7.5 cu. ft. capacity with 14 drying cycles. By multi-steam technology this dryer lets you remove wrinkles, bacteria, odors and static. To be aware of lint blockages in vent you will be reminded by vent sensor. You can control the dryer from anywhere by using your mobile device. Drum is stainless steel to avoid scratches or nicks from metal zippers. After your items are dryed the sensor dry automatically shuts down the power. 800 series Bosh washer has a lot of features. 24 inches sized washer lets you wash 5 men’s shirts in just 15 minutes. Extra protection against water damage comes from AquaStop Plus feature. Maximum 40% faster speed is delivered by SpeedPerfect technology. Long lasting, efficient and quiet performance come from EcoSilence Motor. Anti vibration circular side reduces vibration. Up to 17.6 lbs can be washed at once. WAT28402UC is an amazing time saving. Reversible dooor lets you open the laundry from the right and left. WTG86402UC electric condensation is one of 24 inches quietest dryers. You may dry maximum 18 towels at once. Ducting is not needed because of condensation technology. Drum is made of stainless steel to avoid scratches from metal zips. Large LED dispaly is convenient to monitor and control. 4 temperature setting allows you set different drying options. 15 drying cycles and 8 drying options allow you exploit the dryer in different ways. Super quick program allows to finish drying in just 15 minutes. Electrolux EFLS517STT comes with pedestal and some premium features. Stains are removed by vents steam significantly. Sanitize option eliminates 99% of bacterias and 95% of allergens. You can open reversible door from right and left. Oversized wash loads are kept in quiet washing. 9 wash cycles, 18 minutes of quick wash, delay start, interior lighting and control lock come as accomodating features. EPWD157STT dryer has the same pedestal too. With premium features this dryer will not let your items stay wet. Over drying is prevented by gentle drying feature. Perfect Steam feature releases wrinkles and decreases static to let your clothes be looking perfect. It also has instant refresh cycle that is spun by 10 minutes. Extended tumble option softly tumbles your clothes to keep them look tangle free. It also runs very quietly while keeping your household calm. Coming with pedestal Maytag washer has Powerwash cycle that ptovides through rinse and additional cleaning action. 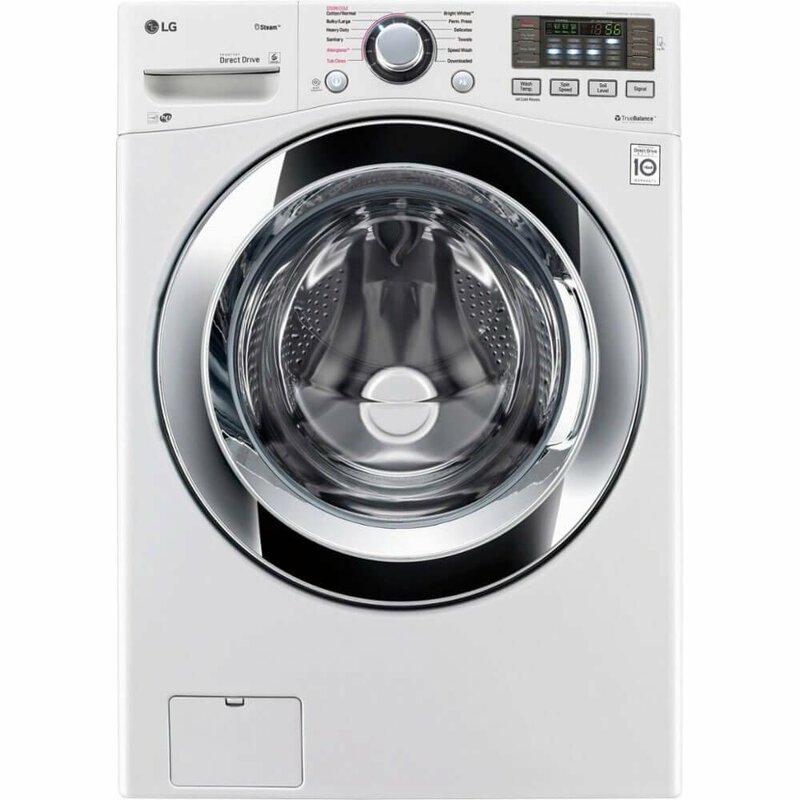 To offer extra large capacity the washer has 4.3 cu. ft. that can fit large sized items. Overnight wash and dry cycles let your dirty items be cleaned and dryed while you sleep. 12 hour fresh hold option stores items fresh and right away dries after washing. Vibration is minimized by advanced vibration control while you make it heavy loaded. Allergen removal cycle allows you to kill 95% of normal allergens from fabrics. With extra big capacity of 7.3 cu. ft lets you dry huge sized laundry right after washing. Gently relaxes wrinkles and with steam clothes are refreshed. Steam option can prevent wrinkles by tumbling at the end and combines with hot water to regulate temperature. Pedestal is a righ assistant to store extra items. 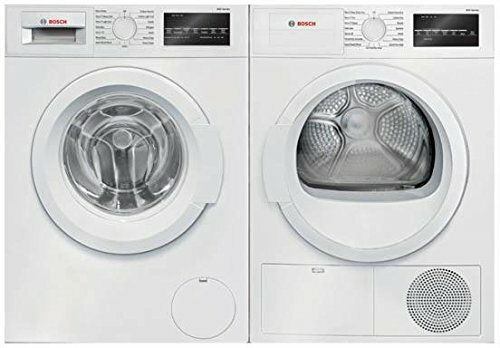 The front loaded washer WAT28401UC from Bosch has 15 wash cycles including Permanent Press, Permanent Press Heavy Soil, Permanent Press Light Soil, Delicates, Quick 30 min, Rinse/Spin, Hand Wash/Wool, Drain, Cotton Normal, Cotton Light Soil, Towels, Sanitize, Jeans, Bulky Large Items and Drum Clean. Up to 40% faster washing speed comes from SpeedPerfect option. Bacteria and allergens are killed by hot temperature up to 170 degress in Farenheitt. Spin speed is up to 1,400 RPM so you can make sure the items are ready for dryer. Anti vibration curcular walls handle the shaking to remove instability so the noise will not come out. The perfect match dryer WTG86401UC from Bosch again comprises 15 dry cycles which are Permanent Press, Permanent Press Extra Dry, Permanent Press Damp, Delicates, Quick 40, Time Dry, Hand Wash / Wool, Air fluff/No Heat, Cotton Dry, Cotton Extra Dry, Towels, Sanitize, Jeans, Bulky Large Items and Quick Dry Auto. Smart sensors prevent overheating by running on autopilot. By storage of 17.6 cu. ft. it can dry maximum 18 towels in single load. The loading window is bigger than WAT28401UC window because its capacity is bigger than its partner’s. With 4.4 cu. ft. capacity this front loaded washer has maximum spin speed of 1300 RPM, 9 wash cycles (Colors, Whites, StainTreat, Rinse & Spin, Quick Cycle, Casual, Normal, Heavy, Delicates), options selection: Clean Water, Delay Start, Freshwater Rinse, Stain Pre-Treat, Light, End-of-Cycle-Chime, LED display, control lock, interior lighting, delay start and reversible door. Two times bigger 8 cu.ft capacity allows this dryer to fit a lot of stuff. Tumble speed of 50 lets you have gentle drying. 9 dry cycles are included such as Casual, Allergen, Delicate, Fast Dry, Heavy Duty, Mixed Load, Normal, Towels and Timed. The reversible door can be opened from left and right. Instant refresh cycle eliminates wrinkles and auto refresh the steam in every 10 minutes. Fast 15 minutes dry is so awesome when you are in a hurry. LED light is inside to let you have an interior observation. Having standard capacity of 4.3 cu. ft. this LG washer comes with pedestal. 9 different wash cycles (Cotton/Normal, Bulky/Large, Perm. Press, Delicates, Speed Wash, Sanitary, Allergiene, Tub Clean, Download/Small Load), 11 varios wash options (Prewash, Rinse and Spin, Delay Wash, Water Plus, Extra Rinse, Child Lock, ColdWash, Signal On/Off, Steam, FreshCare, Custom Program), 5 wash temps (Extra Hot, Hot, Warm, Cold, Tap Cold) and 5 spin options (Extra High (1,300 max. ), High, Medium, Low, No Spin) will make your laundry fresh and clean. The main strength of washer is SmartDiagnosis feature that enables the washer diagnose the problems and troubleshoot. 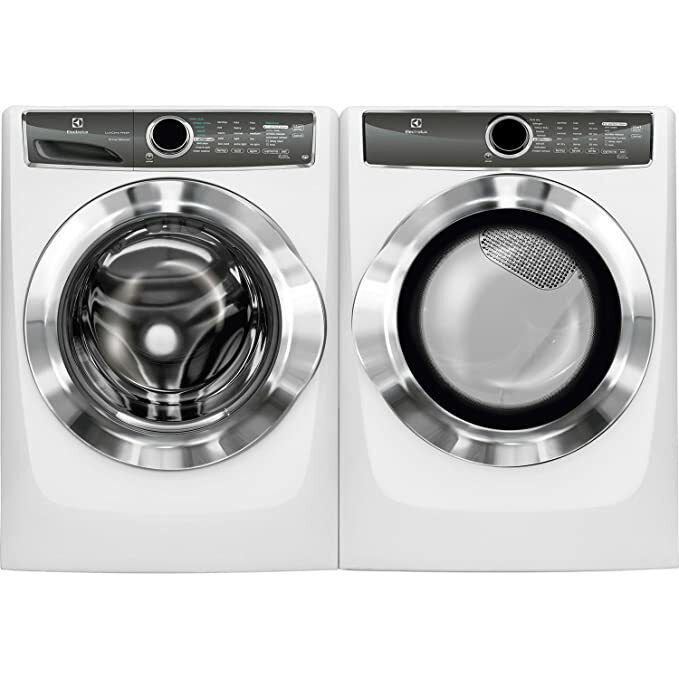 The pedestial installed dryer has 7.4 cu ft capacity which is bigger than the washer’s. By 10 dry cycles (Cotton/Normal, Perm. Press, Delicates, SteamFresh™, SteamSanitary™, Bulky/Large, Anti-Bacterial, Download/Super Dry), 10 dry options (More Time, Less Time, Custom Program, Damp Dry Signal, Wrinkle Care, Child Lock, Signal On/Off, ReduceStatic™, EasyIron™, Energy Saver), 5 temp settings (High, Medium High, Medium, Low, Ultra Low) 5 dry levels (Very Dry, More Dry, Normal Dry, Less Dry, Damp Dry) and 6 manual dry times (60 min., 50 min., 40 min., 30 min., 20 min., More Time/Less Time) this dryer can delicately dry your laundry with refreshed steam. Very solid looking washer from Korean brand Samsung has surprising specs: 14 preset cycles, 12 wash options, 1300 RPM spin speed, addwash door, vibration control, self clean, child lock, four dispencer trays and steam cleaning. 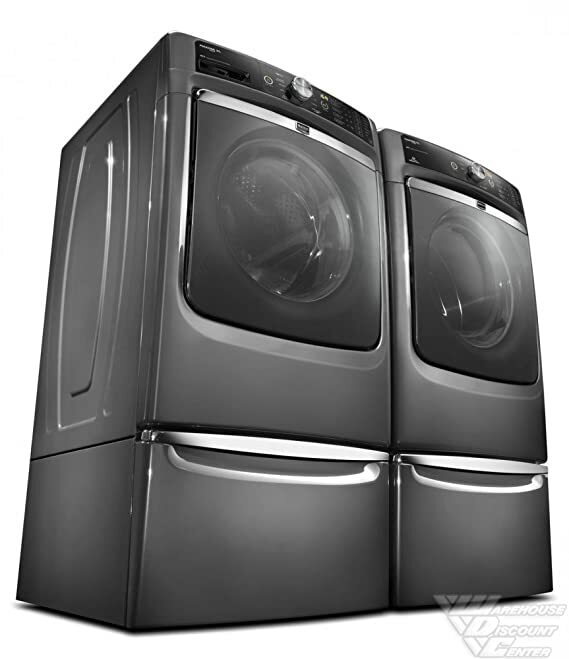 Black stainless steel pedestal is for help in storing extra laundry. Gas fueled dryer from Samsung has 7.5 cu. ft. capacity. Specs are standard in numbers such as 14 dry cycles, 5 temp settings, dual heaters, vent sensors, eco dry, reversible door, child lock, smart home ready, smart care, stainless steel drum and 11 dry options. Stackable washer has capacity of 2.4 cu. ft. which is smaller than typical washer. But spin speed is 1400 RPM. 14 different cycles, 5 temp options, auto temp control, auto bleach dispencer, delay start, eco friendly option, pre wash option, extra rinse option and steam wash are also typical features. Howver, the price is lower than other top 9 best washers. 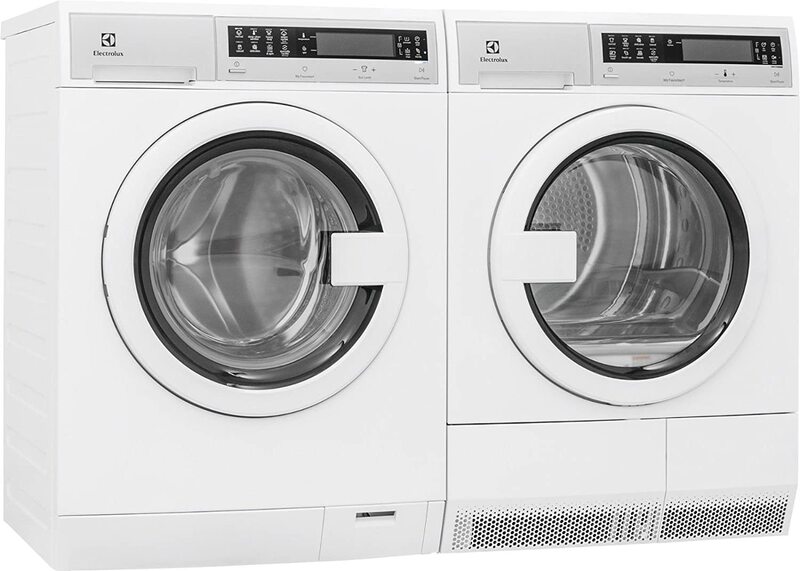 Electric and ventless dryer from Electrolux has 4.3 cu. ft similar to typical washer’s capacity. 11 dry cycles, 3 temp options, delay start, wrinkle release, IQ touch controls, moisture sensor, adjustable legs and condensative drying system. If you have small family you could go for this washer and dryer set as they are the smallest in capacity. All the reviewed washer and dryer sets are awesome. However I chose the one with more units of tech inside. 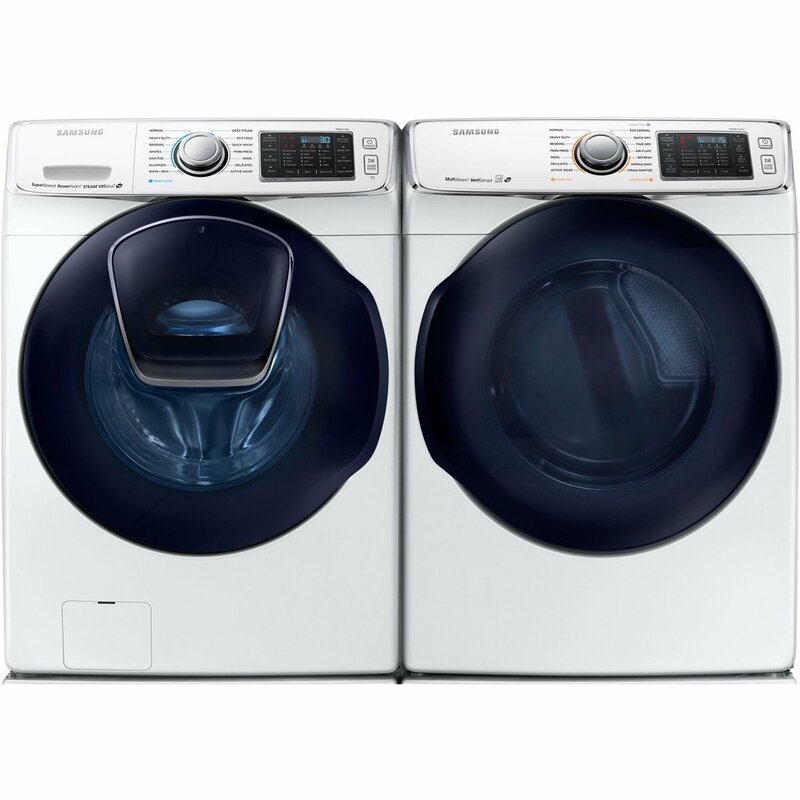 It is Samsung WF50K7500AW Washer and DV50K7500EW Dryer because of remote control and bigger size. Their prices are quite similar except the last 10 th price. It has $500 lower price tag. But you may choose any one of them according to your own criteria. With such huge numbers of washer and dryer choices today, it can be difficult to choose which one best suites your requirements. Do you have a family with a considerable measure of clothing? Is its performance critical to you? Do you give it a second thought if it is vitality effective? Here are some a greater number of the best things to consider before picking the best washer and dryer for your household. To start with, figure out what you and your family needs in a washer as far as limit, water and vitality proficiency, volume, length of wash cycle, programs, and separating frameworks. For the most part, there are two kinds of cloth washers — top-loading and front-loading. Each has their own pros and cons. For example, a top loading isn’t as washing effective as a front loading. In any case, a front loader for the most part has more pre-programmed wash cycles. Storage is one of the worrying factors while picking a washer. Pick a machine that will address the issues of your family. Most washers measure in kilograms. A machine that can handle with 6-7 kilograms (around 12-15 pounds) is sufficiently suitable for a family with several kids. Efficiency in water usage is estimated how many liters are used in one wash. Since every state has their own water supply price, check with your nearby water utility supplier to decide the most ideal approaches to spare in your general leisure. Remember that the top loader isn’t as washing proficient as the front loader. Regardless of whether you mind how boisterous your machine is relies upon your living circumstance. Do you live on the second floor, and would you say you are remembering your neighbor’s need? Where will your machine be standing? In case you’ll be doing clothing in the storm cellar or carport, its volume won’t make any difference as much as though it’s situated in the family room. In case you’re frequently in a surge, or you have a great deal of clothing that should be done in light of the fact that you have an big family, you don’t need a washer that takes too long to run a heap. Top-loaders are generally best in case you need shorter washing cycles. While numerous projects on a clothes washer aren’t vital, you may pick one machine over another for a particular program that interests to your necessities. Numerous are accessible, for example, turn speed, delicate cycles, and hand-washing cycles. Some high-end washers can even decide the span of the heap, the correct cycle to utilize, and how grimy your clothing is. These machines will probably be more costly than budget ones. The sifting framework strips build up far from your garments as the machine washes them. In some cases, top-loaders have issues with stripping ceaselessly build up. However, you have a great deal of build up or creature hair on your garments, you might need to put dirty clothes into a front-loader. Notwithstanding a portion of the above pros and cons, top-loaders are generally less expensive, more lightweight, and have a bigger storage. Nevertheless, they are regularly less vitality proficient, utilize more clothing cleanser, and harder on apparel. Front-loader clothes washers are generally more vitality proficient, utilize less cleanser, and have a quicker turn cycle, which prompts a shorter drying time. In any case, they are at first more costly than top-loaders, can wrinkle garments, and are even heavier. While you should in any case do some exploration before picking your dryer, most dryers are genuinely equivalent. They all turn your dress in a drum with a warmth source. The following are two of the biggest ways they contrast. In case you’re spending plan cognizant, you might need to consider utilizing a gas dryer since they’re more vitality proficient. Moreover, despite the fact that dryers utilize a great deal of vitality, more up to date models have particular choices for drying dress that can spend less vitality relying upon the setting. You can decide on one that has a chill off cycle, a dampness sensor that advises the dryers when to close off, and a clammy dry cycle. For drying things like shoes, a few dryers additionally have a sans tumble cycle. Also, consider introducing a dryer-vent supporter to expand productivity and the life of your machine. Dryers are evaluated by their ability estimate, so picking one that supplements your washer limit is savvy. For instance, a 3.5 cubic-foot washer would require around a 7 cubic-foot dryer limit. Dryers by and large come in sizes running from 5-7 cubic feet in limit. Picking a washer and dryer truth is stranger than fiction for you can be extreme, however it’s feasible in the event that you remember these couple of things. Once you’ve picked the ideal set, you can introduce them wherever best suits your necessities. Dryer racks secure caps, tennis shoes, and sensitive things from getting thumped around by suspending them over the drum for without tumble drying. The element is commonly inaccessible on humbly valued machines (dryers under $500). In any case, the vast majority don’t utilize it that much. Unlike clay covered steel drums, tempered steel ones remain free of scratches and scratches caused by metal zippers, catches, and bolts. Be that as it may, they don’t upgrade dryer productivity. Being ready to control your machine remotely through an application on your PC or individual gadget can consume you. The National Fire Protection Association says a garments dryer ought to never be worked when you’re dozing or out of the house. One out of each 22 home structure fires somewhere in the range of 2006 and 2010 included a dryer or clothes washer. This savvy highlight may spare your dryer inclinations, yet it doesn’t improve machine execution or usefulness. • Eco-mode: It might sound naturally benevolent, however it’s simply a low warmth setting with a broadened drying time. • Speed dry: You can accomplish a similar impact by running a heap for 15 minutes on high warmth. Wrinkle monitor: Once attire is dry, it’ll tumble clothing without warmth for up to 60 minutes. However, it expands a cycle’s vitality use by up to 10%. Steam modes: They guarantee to evacuate wrinkles and spruce up attire. Be that as it may, this is what gets us angry as a mad bull: This capacity can utilize 20% of the vitality spent on a normal drying cycle without evacuating a solitary wrinkle. Cost-cognizant purchasers guarantee to accomplish comparable outcomes by adding a clammy washcloth to a wrinkled load. • Hire an authorized handyman to introduce a gas line to your pantry. Expanding a gas line costs $150 to $1,000, contingent upon the length and unpredictability. • Hire a HVAC contractual worker who has practical experience in dryer vent establishment. Cost relies upon how shut your pantry is to an outside divider and how work concentrated it is to slice through. Property holders can hope to pay $150 to $500. FYI: You’ll likewise need to connect your gas dryer to a 120-volt outlet. • Add a committed 220-volt circuit. On the off chance that your pantry doesn’t have one, you’ll require an authorized circuit tester to introduce. Costs go from $300 to $800. FYI: About 72% of private garments dryers are electric. • You might have the capacity to exchange it for a discount on your new machine. Check with your retailer before purchasing. • If it’s in great working condition, give it to a neighborhood philanthropy. Doing great may score you an expense reasoning. • If it’s broken, check with your neighborhood region on the best way to reuse.